While in Barcelona, we tried to visit a couple different Gaudi landmarks, and were hoping to walk around Park Güell and take some photos. Unfortunately, we made a critical mistake – not buying tickets in advance. We were able to walk around the outside of the park, and a small open area, but missed out on the best parts of the park. On the upside, we’ve learned from our mistake and next trip will be better prepared (and pre-purchased 🙂 ). If you are interested in Gaudi’s art, or Art Noveau/Modernisme in general, you really do need to visit this park, the mosaic work is amazing, and the Modernisme architecture is absolutely stunning. I took a lot of photos outside the park, but I do like how this one of the park entrance full of tourists came out. It was taken in one shot using a d610, and heavily edited in On1. I wanted to make something odd/interesting and really bring out the details of the buildings. 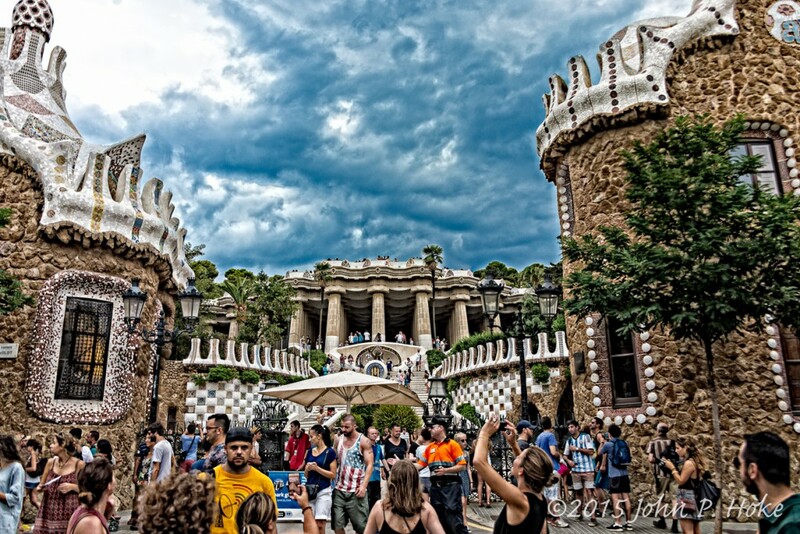 This entry was posted in Photography, Travel and tagged 2015, barcelona, catalonia, d610, europe, gaudi, landmarks, on1, Park Güell, photoblog, photography, spain, vacation.